As one of the 130 countries Abbott Laboratories has a presence in, Abbott Nutrition South Africa first opened its doors on the 9th July 1940. For more than 70 years, Abbott Laboratories has remained committed to the highest standards of quality, excellence and innovation. As leaders in science-based nutrition, we continue to support your nutritional needs throughout life’s stages. Abbott South Africa is proud to bring its beneficial products and services to the people who need them. 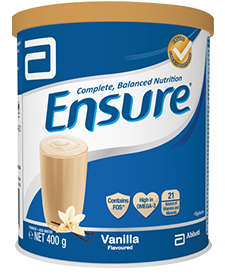 For almost 40 years, Ensure® nutritional drinks have been bringing complete and balanced nutrition to those looking to take charge of their health. Ideal for today’s fast-paced environment, Ensure® is made by simply mixing with water and can be enjoyed as a meal, with or in between meals. Available in Vanilla, Chocolate and Strawberry* flavours. It's perfectly natural to feel concerned over what to expect during your pregnancy. In this section, you will find some nutritional tips and tools to support you during this special time as well as a weekly pregnancy guide to watch your baby grow.